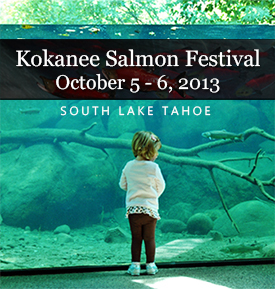 Kokanee Salmon Festival is taking place October 5-6, 2013 at Taylor Creek Visitor Center in South Lake Tahoe. Educational and free, the Kokanee Salmon Festival offers fun for the whole family! Come and celebrate the annual fall migration of the land-locked Kokanee Salmon with activities galore. Go on a Treasure Hunt, do some Fish Painting, meet the mascots Sandy and Rocky Salmon, and say, “Hi,” to Smokey the Bear. Participate in the Salmon Feed, and take part in the Kokanee Trail Runs. Watch the “Wild Things” presentation, or the “Drama of the Kakanee – an Interactive Play” at the Lake of the Sky Amphitheater. Forest Service biologists will be on-hand all day Saturday and Sunday to show you the natural wonders of Taylor Creek along the half-mile Rainbow Loop Trail. There is even an underground Stream Profile Chamber along the Rainbow Trail path. The Kokanee Salmon Festival takes place from 10:00 AM to 4:00 PM at the Lake Tahoe Visitor Center at Taylor Creek, just 3 miles north of South Lake Tahoe, CA (just north of Camp Richardson Resort and Marina). For additional information contact the Lake Tahoe Visitor Center at (530) 543-2674.